Zsa Zsa's Party Parrots are a troupe of exotic performing birds that have been performing since 1977 and are located in Houston, Texas. Zsa Zsa, the star of the show, is the barbie-doll of the bird world. From Fiesta to Formal, Western to Medieval, Safari to Southern Belle, Zsa Zsa has it all. 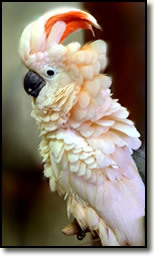 Even though Zsa Zsa likes to dress up, she and her Party Parrots often attend events dressed in just their feathers. Some hosts and hostesses enjoy having the birds more accessible to their guests, and arrange for photographs to be taken. 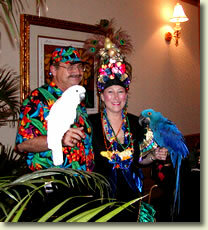 Zsa Zsa and her Party Parrots have graciously donated their time to many charity events over the years. If you have a local charity function you'd like us to consider, please let us know. The presence of Zsa Zsa's Party Parrots adds a splash of color and excitement to parties, wedding receptions, openings, conventions, promotions and your next special event! Let Zsa Zsa the costumed cockatoo greet your guests at the wedding reception while they wait for the Bride and Groom. Children love to play dress up, and so does Zsa Zsa! This fabulously friendly cockatoo will come to your child's party with her wardrobe of clothes. Let Zsa Zsa and her friends mix with your guests at your next corporate event. Add some tropical atmosphere and color to your next social occasion. Zsa Zsa has a great deal for new clients. Make a $300 donation to her favorite charity and she will donate double that amount to yours! We will give the new client 2 birds and 2 handlers in theme attire for photo opportunities and crowd interaction during the first hour of your charity event. This is a $600 value from Party Parrots. CAP - Houston, using the Donate button below. Your kindness and goodwill will earn you twice the value back, as well as provide you with a tax deduction. Be sure to include your contact information so that Zsa Zsa's people can schedule your event!